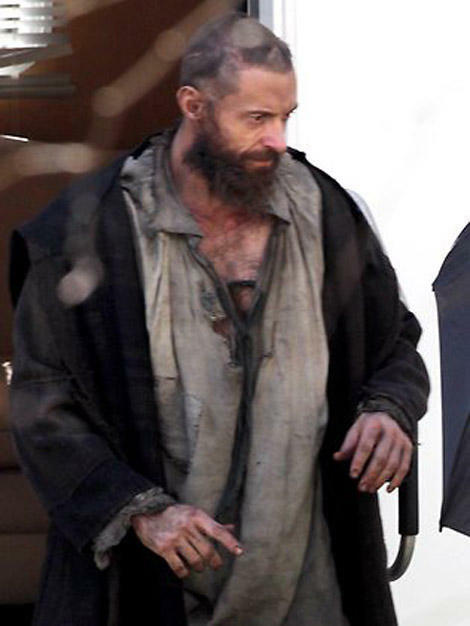 First Look: Hugh Jackman in “Les Miz.” | The Cineaste's Lament. ← New “Raven” Images, Anyone? The Australian actor — who has serious Broadway chops — plays Jean Valjean in Tom Hooper’s (“The King’s Speech“) big-screen adaptation of the famed musical. Anne Hathaway, Amanda Seyfried and Helena Bonham Carter also star. Russell Crowe rounds out the cast as the evil Javert. This entry was posted in Books On Film, Film News, Movie Musicals and tagged Amanda Seyfried, Anne Hathaway, first look at Hugh Jackman in Les Miserables, Helena Bonham Carter, Hugh Jackman, Les Miserables set photos, Russell Crowe. Bookmark the permalink.